You will receive a discount on room rates for „The Little Grand Hotel, Vina del Mar“! Please inform us if you wish to receive a contact for the South American liability insurance in Europe! You need a tour guide in Valparaiso?!? We are pleased to find a German-speaking guide on a motorcycle! A packaging for your motorcycle is not necessary. 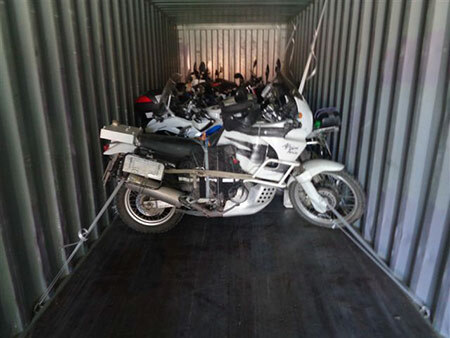 For the time from autumn to winter, we offer periodic transports to Valparaiso for unpacked motorcycles via collection container. Departure depends on the arrival dates of the voyagers. You just need to book your flight while we transport your bike to the destination in good time. Interim storage at a safe place in Germany or Chile is included in the price. It is possible to retrieve the unpacked motorcycle at your premises. Return transport from Valparaiso to Hamburg will take place between January and middle of April. From experience but yet depending on the delivery situation, departure takes place every 4 weeks. Interim storage at a safe place in Germany or Chile is included in the price. It is possible to deliver the unpacked motorcycle to your premises. After your arrival, please contact our local partner for a joint customs clearance. Now you just need to pick up your motorcycle and off you go! The approximate time duration comes to 1 day. For a joint customs clearance, please contact our local partner after your arrival. Now you just need to pick up your motorcycle and off you go! The approximate time duration comes to 1 day. Please contact our forwarding agent a few days prior to return transport and coordinate your vehicle´s drop off. Upon completion of your vacation and customs clearance, your motorcycle will be handed over. Anything else will be organised by us here in Hamburg or by our partner at the destination. To our knowledge, a so-called Carnet de Passage is not mandatory for the whole of South America. For a binding information concerning final import of vehicles, please be addressed to the automobile club or the customs authorities at the destination. When you are ready to purchase, we will prepare a forwarding contract. Please return with your signature. A first partial billing of transport will be effected close to collection/handing over of your motorcycle, we do not charge any deposit when the contract is concluded! As an option, we offer a transport insurance against total loss and transport damage of your motorcycle. The premium amounts to 0.95% of the vehicle value, at least € 95.00. Paint damages and oxidation are excluded, vehicles older than 9 years are insurable against total loss only. Please note that additional luggage stowed in the transport box is uninsurable. We recommend to inform yourself about a traveller´s baggage insurance. In case of damage, it must be visible from outside. Retention comes to € 500.00 per claim. The costs for motorcycles with a width upto 90 cm amount to € 949.00 for each bike from Hamburg to Valparaiso. Return transport will be charged with € 1,249.00. If you book both ways, we will charge € 2,099.00 altogether. Each further 10 cm cost € 75.00 per direction. We are prepared to grant group discounts for 5 or more motorcycles. MOTOCROSS-SCPECIAL: for transport of MX-bikes without sidebags up to 600 ccm as well as Husky 701 for example we offer a special rate of EUR 1650,00 both ways. The prices are based on current fares and also include present fuel and security charges as well as fees for dangerous goods besides all port and clearance charges. We hope this information has been helpful for you and we are looking forward to a feedback. Do you like to receive a detailed offer? Please inform us about measures of your box and your motorcycle as well as your planned travel time. We are pleased to submit an individual calculation free of charge. Please control your spam folder for our replies, especially in case of gmail or googlemail accounts!.